When Michael Emerson says “Mr. Queen,” it sounds nefarious. When he says “your son,” it’s terrifying. When he says “speaking of which,” leaning really hard on that wh- sound, it’s delicious. And then he gets to trot out something like “Just as Alexander rained destruction on Persepolis, so do I now on Averwood Pharmaceuticals,” and it’s totally different from basically anything else he’s said on the show. That line is such a supervillain line, but it’s from before Cayden James is a supervillain, so it sounds different. 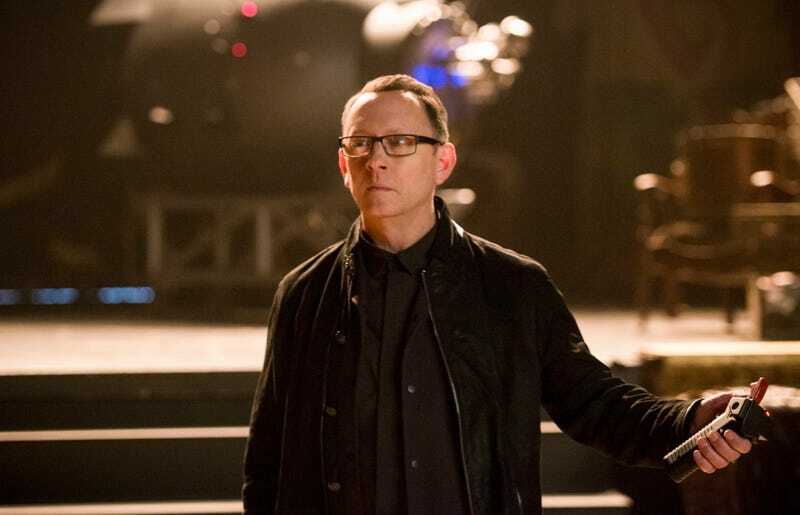 It’s because Michael Emerson is a very good actor, and he’s great — great — with language. It was probably too much to hope that once Cayden James became aware of the manipulation that led him to weaponize his grief, that he’d get angry and wreak havoc in a new direction, becoming more entertaining and dangerous all at once. Sure, there was a chance that once Team Arrow proved that Oliver wasn’t responsible for the death of James’s son, James would become one of two big bads in this season, a force pushing against both sides, but as both a character and a villain, James got progressively more predictable, and that’s never a good sign. More ominously, he also seemed something less than ferociously intelligent, making him a much less fearsome villain. So the events of “The Devil’s Greatest Trick” come as no great surprise but they’re still a letdown. What’s not disappointing in the least is that to the end, Emerson digs into every line with tremendous gusto — sometimes almost, but never actually, too much. He treats this stuff like it’s Shakespeare, and while there are some good pieces of writing here, there are some clunkers, too. Yet he makes them sing. Consider the scene where James goes from being ready to blow up the city to take down one person — a person whose identity is uncertain — to blaming himself for his son’s murder because Oliver acted like a dad in his line of sight. That’s ridiculous, but it works, because he’s so committed. He makes that leap, makes it so Cayden makes that leap, and there is no earthly reason that should seem plausible. Such is the power of a great actor, and it’s a rare pleasure, watching a great actor play a great villain. It’s totally possible that the heretofore ill-defined Ricardo Diaz will also be a great villain. Kirk Acevedo is certainly a capable actor, and that final scene certainly crackled (another fun thing to hear Michael Emerson say: “thinning the herrrrrd”), but unlike the big Cayden James climax, the Diaz reveal isn’t so thunderous that it’s easy to overlook the giant plotholes. Wasn’t Diaz just high-tailing it out of town? How exactly did he intend to stop Cayden James from destroying the city he’s so delighted to conquer when he didn’t know where James or the bomb were? If he’s capable of doing everything required to convince a top-tier criminal hacktivist that his son was murdered by a famous vigilante who isn’t exactly great at covering his tracks, why did he need James in the first place? Whatever, there’s obviously more to come in that area. While it’s relatively predictable reveal — once it becomes clear that the perpetrator is neither Anatoly (suspected by Oliver, so obviously innocent) nor Laurel (confesses, so obviously innocent) is the culprit, that leaves either Diaz or an unknown party — the acknowledgment that Oliver and company have already lost a war they didn’t know they were fighting is a reasonable exciting one. What’s frustrating is that the Cayden James story ends with a whimper, not a bang. Even that knife goes in pretty much silently. At least before James bleeds out in that delightfully sunny interrogation room, we get a glimpse of his life pre-Oliver Queen fixation. It’s not the best flashback in the history of Arrow, but like the flashbacks in “Deathstroke Returns”/”Promises Kept,” it’s both new information and character development. More importantly, it’s carried by Emerson, who as mentioned above, finds a way to show us exactly how much his life and world were changed by the death of his son. There’s familiarity in this younger Cayden, but he moves and speaks with a different kind of sorrow. It’s loneliness, not rage, and that makes all the difference. Emerson’s excellence, which we’ll now presumably lack, isn’t enough to compensate for a strange episode. It’s a ticking-clock story in which there’s relatively little urgency, a mystery in which there’s not much hidden, and an hour riddled both with dropped plot-lines and deeply stupid decisions. (William, when there is a giant bomb, do not leave the bunker.) “We saved the city, again,” Felicity says, before remarking that it sure doesn’t feel like they won. Agreed. Felicity. Emerson’s fireworks aside, that was one hell of an anticlimax. Well, except for one of the most messed-up scenes in Arrow’s history. I can’t find the original post at the moment, but cheers to the commenter who last week remarked that the Quentin-Not Laurel relationship is deeply creepy, because this week that became much more apparent, particularly in that final car scene. Shot in a style different from the rest of the episode, jittery and invasive, the scene in which Quentin handcuffs a bleeding and unconscious Laurel in place in the back of his car can only be described as fucked-up. A man telling a woman he doesn’t really know that somewhere deep inside her is a piece of his dead daughter, then driving away with his bleeding prisoner, is dark and ugly. I have to believe that the manner in which that scene was shot indicates that the show wants us to feel that way, but the story to this point doesn’t say the same. Arrow just lost the most exciting element of its season, then drove off in a direction that could be disastrous. See you in March. I will only accept two episodes in which Kacey Rohl doesn’t do much if they’re meant to indicate that she’s about to be around a lot more. Oliver’s little “ugh I don’t wanna do this” look before saying “I have an idea” and calling in a favor from Barry Allen was perfect and funny and also about how I’m feeling about The Flash right now. Salmon ladder watch: hope springs eternal.